DISCOUNTS FOR RENTALS OF 4 WEEKS OR MORE - EXCELLENT SUMMER RATES. CONTACT US. 'Leisure Lee' your home away from home - nestled between the deep blue Atlantic Ocean on one side and the Caribbean on the other. Our lovely home is situated high above sea level and surrounded by lush tropical landscaping and stunning views of the ocean can be seen from every room. Cool tropical breezes are enjoyed throughout the home and for those warmer summer months, all rooms are air-conditioned. Enjoy the kitchen which is beautifully equipped for in-home dining and entertaining. The sunrises and sunsets are spectacular from the wrap around balcony where you can sit and enjoy your morning cup of coffee or your evening cocktail under the stars that appear close enough to touch. 'Leisure Lee' is a private, spacious and fully furnished 3 bedroom 2 bath home ideal for families, couples and honeymooners, situated in Rainbow Bay minutes away from its own private beach, its sparkling white sand and crystal clear waters perfect for kayaking, shelling, snorkeling and fishing. Rainbow Bay also has its own Private Restaurant and Tennis Courts so come on over, sit back, relax and enjoy your stay at your vacation home in beautiful Rainbow Bay. There are numerous places to visit and see on the Island of Eleuthera such as Preacher's Cave - a magnificent subterranean cave situated at Hatchet Bay that gives the appearance of a vaulted cathedral that is more than one mile long with stalagmites and stalactites that gleam in torchlight. The Glass Window Bridge in Gregory Town - This is an unbelievable site where the deep waters of the Atlantic almost meet the calm seas of the Exuma Sound on Eleuthera's leeward side by as little a distance between them as 30'. A truly remarkable sight that has to be seen to be believed. Surfer's Beach where those of you who love the sport of surfing can enjoy this area that many 'experts' compare with Hawaii's best spots. Just off the North coast of Eleuthera is Dunmore Town, Harbour Island, the oldest and most charming Settlement in the Bahamas home of picket fences and warm friendly people and a winter home to many of our Rich and Famous. You must come and join us at Friday evening's Fish Fry at Arthur's Beach in Governor's Harbour - music is always supplied with dancing in the street and is a perfect opportunity to meet with the locals and fellow visitors. Grilled or deep fried Chicken and Fish are the usual dishes to be had and the wonderful rum drinks are a must. Rainbow Bay Club, the Laughing Lizard, Billy & Brenda's, Tippy's, Buccaneers, The Beach House and Sunset Inn - great places to kick off your shoes, have a great meal and enjoy the beautiful Island of Eleuthera. There are numerous other places to see in Eleuthera some of which are Ten Bay Beach in Savannah Sound, the Ocean Hole in Rock Sound, Light House Beach in Bannerman Town and the world famous 'Haynes Library' in Governor's Harbour. Don't take our word for it - come and see for yourselves what a beautiful place this is - we know once you come here you will fall in love with our home and our Island and the warm, friendly people who live here. Transportation available. Rates on request. Car Seat for baby/child up to 80 lbs. also provided. Information on flights to Governor's Harbour Airport (nearest Airport to Rainbow Bay) can also be provided. Housekeeping and catering services available. For further information, please contact Mr. Freddie Ferguson who would be happy to assist. 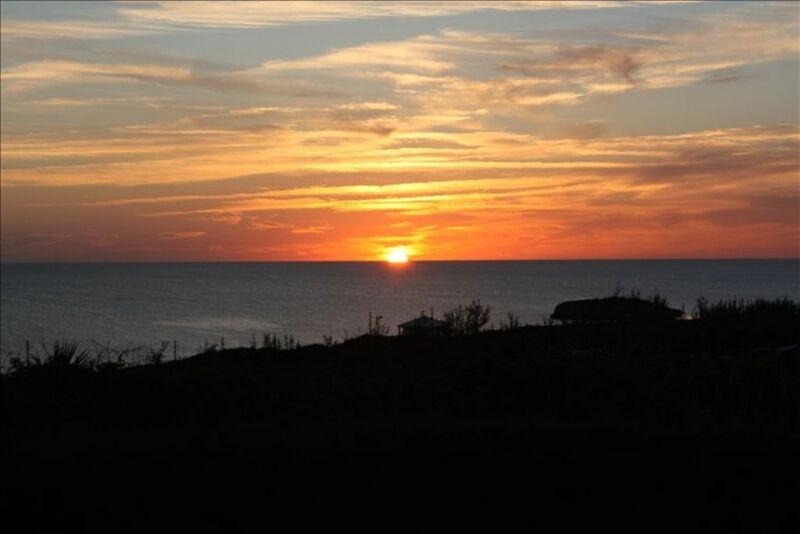 The location - minutes away from four of the most beautiful Settlements in Eleuthera - James Cistern and Governor's Harbour to the South and Hatchet Bay and Gregory Town to the North. Private beaches, tennis courts and restaurant - Shops, Grocery Stores and Utility Companies all in close vicinity. We love the wide open views of the Atlantic Ocean and Caribbean Sea. The colours of the sea are breathtaking. The wonderful sound of the rain on the roof - so soothing. At night, the stars seem almost close enough to touch. It is a truly tranquil place to spend time away from the hustle and bustle of the City. The Atlantic gives a fantastic view to the right and East. The Caribbean is breathlessly calm compared to the Atlantic 'ocean side' and can be seen the same time as the ocean. Extensive collection of movies in both DVD and VHS format. A car can also be provided at a rental of $60 a day and advice on booking flights (the closest airport is Governor's Harbour). A car seat is also provided for baby/child up to 80 lbs. Our stay at the Leisure Lee was great! This is a very nice home. We had everything we needed. We will definitely visit again. Beautiful home with excellent views and amenities. It was our second time at this home. Tremendous views of both the Atlantic and Caribbean from the deck. No neighbors and very secluded so you have all of the privacy you want. Centrally located about 2 minutes from Rainbow Inn, 6 minutes from James Cistern (JC), 20 minutes to Governor's Harbour, and about 10 minutes from Hatchet Bay. The home is well appointed and the air conditioner keeps the house very comfortable in any weather. Satellite TV and internet work well. The well-equipped kitchen has everything you can imagine. It is perfect for families. The clothes washing machine is a welcome convenience and the provided snorkeling is a nice touch. The owners are kind and thoughtful, and the property's caretaker lives a stone's throw away and is one of the nicest people you'll ever meet. I can't wait for the next trip! The owners John and Olinda were fabulous to work with. This was a welcome home visit for us as our parents built and lived in this house 25 yrs ago. We were joyed to see how well maintained Leisure Lee was and furnished with all the luxuries of home. Well stocked kitchen, fridge with ice maker, 2 eating areas with open kitchen, living, and dining room. Windows with ocean views on 3 sides. The addition of A/C allowed for total comfort living. Coffee on wrap around deck with spectacular views and sunsets-priceless. Rainbow Bay Beach just down the road. Always an adventure either snorkeling or swimming with both calm Caribbean or mysterious Atlantic ocean beaches available. Bahamians are very welcoming. Leisure Lee is a quite, private property but restaurants and small grocery stores are available along the Queens Highway. Our family vacationed here for a week but are bringing home a lifetime of memories. We had a terrific vacation! Thank you for everything!